Penny Candy Books, 9780998799971, 40pp. 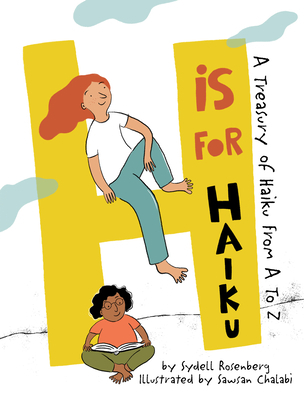 In H Is For Haiku: A Treasury of Haiku from A to Z, the late poet Sydell Rosenberg, a charter member of the Haiku Society of America and a New York City public school teacher, and illustrator Sawsan Chalabi offer an A-Z compendium of haiku that brings out the fun and poetry in everyday moments. Sydell Rosenberg (1929-1996) was a charter member of the Haiku Society of America in 1968 and served as HSA's Secretary in 1975. Her short poems - notably haiku and senryu - as well as other poetry, were published in various magazines and anthologies. Syd received her M.A. in English as a Second Language from Hunter College in 1972. It was Syd's dream to publish a book of haiku for children. She lived, wrote, and taught in New York City. Sawsan Chalabi is a Lebanese-American illustrator and designer. She earned her MFA in Illustration from Savannah College of Art and Design. When she is not at her computer making digital illustrations, she can be found in her studio getting messy with inks and paint. Her work has been published with several magazines and publishing houses such as Cricket Magazine, Bust Magazine, Wine & Spirits Magazine, Applied Arts Magazine, Penguin, and Lee & Low Books, among others. She currently resides in Washington, D.C.